The Crowned Hornbill belongs to the subfamily Bucerotinae. 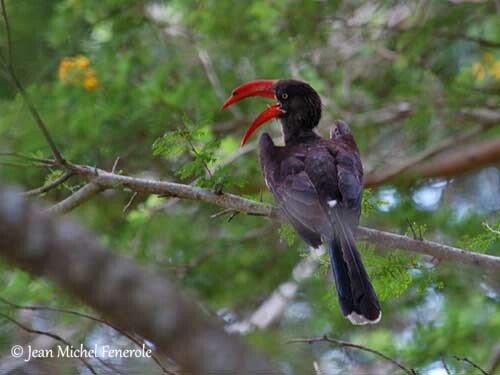 The genus Tockus includes the African species, the smallest of all hornbills. 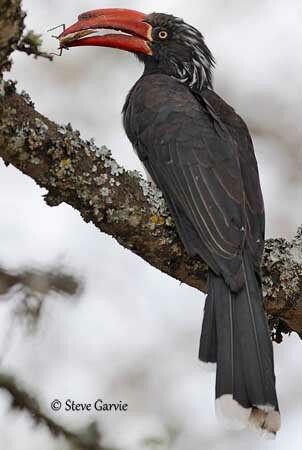 The adult male has sooty-brown plumage on the upperparts, head, chin, throat and breast. The belly is white. On the wings, the flight feathers are edged buff. The long tail is white-tipped. On the head, we can see an indistinct, broad, white eyebrow, and a flat crest on the crown with some longer whitish feathers. The bill is dark orange-red with a casque on the upper mandible. There is a yellow line at base of the bill and the throat skin is dark. The eyes are orange. Legs and feet are blackish. The female has similar plumage, but she has smaller casque and yellower line at bill base. Her eyes are yellower. The throat skin is green. She is slightly smaller than male. The juvenile shows white flecks and buff edges on the wing-coverts. It has yellow bill with indistinct casque. The throat skin is dull yellow. The rectrices are buff-edged too. The Crowned Hornbill utters series of melancholy whistles “chleeoo chleeoo”. It also gives bugling calls in threat display. The loud whistling call is usually given by both mates at once, while raising the head. 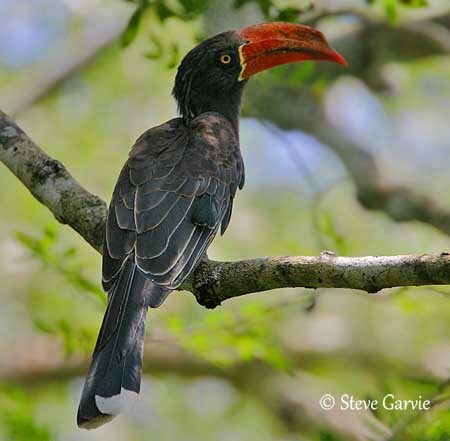 The Crowned Hornbill frequents forested or lightly wooded country with thicker forest patches, and riverine and coastal forests on the eastern coast of southern Africa. It also be found in open fields and may enter gardens in urban areas. 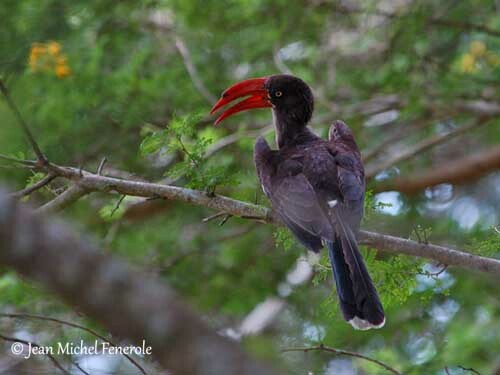 The Crowned Hornbill is found in SW Ethiopia, NE Zaire, NW Uganda, C Kenya and S Somalia to Angola, extreme NE Namibia, Zimbabwe, Mozambique and E South Africa. 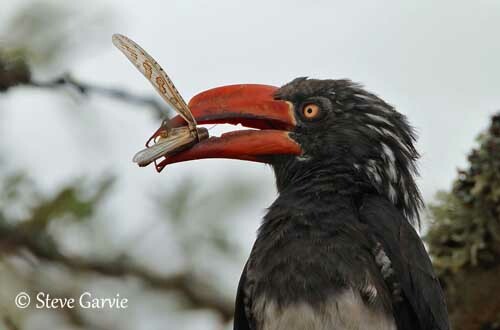 The Crowned Hornbill feeds mainly on arthropods and also takes fruits during the dry season. It consumes snails, small birds, lizards (chameleons), and golden moles (Chrysochloris). It takes many insects such as grasshoppers, hairy or hairless caterpillars, termites, wasps, moths and beetles. It consumes numerous fruits, and also crops (oil palm – Elaeis guineensis), peanuts, maize and bananas. 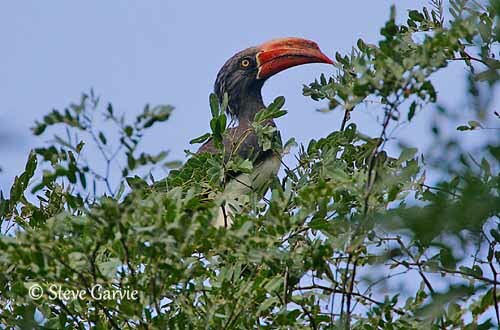 The Crowned Hornbill forages among the foliage in tree canopy. It often plucks off insects from the vegetation, but it is able to catch them while flying. 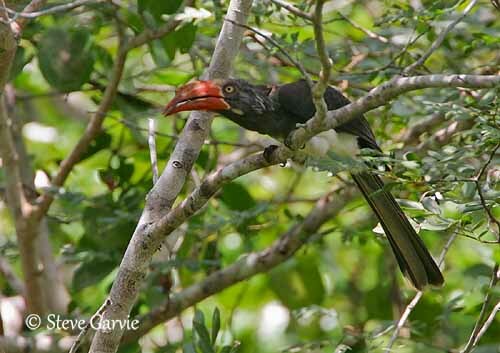 This is a gregarious species, and these hornbills are usually seen in small or large flocks. They roost at definite sites. Each roost-site is used for two-three weeks and then, they change and move on to a new one. They roost by perching on slender twigs open to the sky above. The Crowned Hornbill is sedentary in stable evergreen forest, but during the dry season, they wander in flocks of up to 80 birds after the breeding season, and reach more deciduous habitats. Some altitudinal movements occur in E Africa. The Crowned Hornbill, as most hornbills, flies with rather slow, deep wingbeats, followed by short glides between bouts of flapping. The flight is usually direct and undulating. The laying occurs at the beginning of the rainy season, between October and January in C and S Africa, and February-July or September-November in E Africa. The Crowned Hornbill nests in natural cavities, in tree trunk or large branches at about 1, 50–12 metres above the ground. The lining is made with bark flakes brought by the male. Then, the female uses her own droppings for sealing the entrance. She is fed by the male through a vertical slit. She lays 2-5 white eggs after 1-2 weeks of pre-laying period. She incubates during 25-27 days. The chicks hatch 2-4 days apart. The male feeds the female and the chicks at nest. The female moults flight feathers and rectrices while she is in the cavity. Then, she breaks down the entrance and both parents feed the young which fledge 46-55 days after hatching. They remain in family group until the following breeding season. The young have to break down the sealed nest entrance. This work can last from some hours to several days. They are able to fly very quickly and remain with their parents. 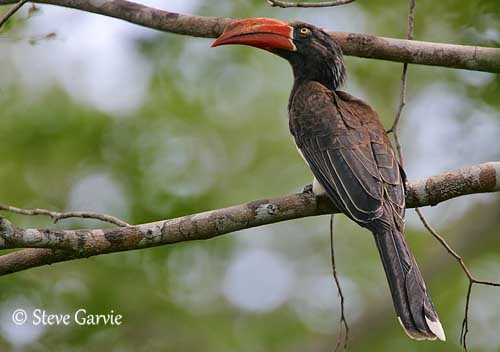 The Crowned Hornbill is a widespread species which is locally common in suitable habitats. It wanders according to the food resources, and in response to local disturbances. 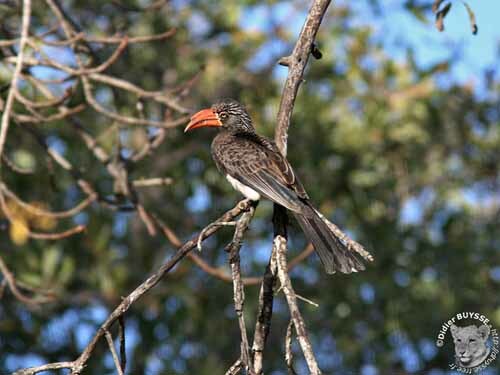 In Somalia, deforestation may reduce the populations of this species, but currently, the Crowned Hornbill is not threatened. The pair-bonds are for life and both mates are territorial. 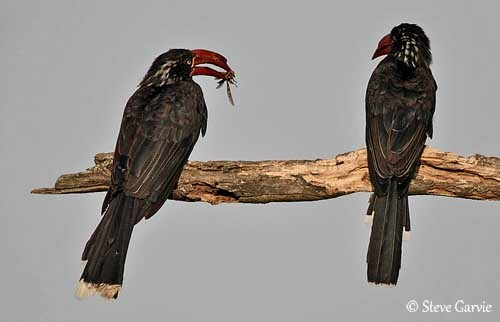 As all hornbills, they nest in cavities into which the female immures herself as soon as she is in laying conditions. When the sealing of the entrance is done, with only an elongated vertical slit, the female sits on the nest during a pre-laying period of some days, and then, she lays her eggs. The Crowned Hornbill feeds on insects of several species, plucked off from foliage or caught in flight. It also consumes numerous fruits, small birds, lizards and golden moles. It forages mainly among the tree foliage.